A new Egyptian satellite will track the construction of an Ethiopian hydroelectric dam over which officials in Cairo and Addis Ababa have been locked in a standoff over fears that the project will hinder Egypt's access to the Nile river waters. Launched almost two weeks ago, Egysat will monitor Ethiopia's Grand Renaissance Dam by capturing high quality photos of the construction site along with other sources of the Nile, said Alaa El-din El-Nahry, vice president of Egypt's National Authority for Remote Sensing and Space Sciences. The LE300 million satellite – which will come into operation in mid-June after a two-month test period – will track the dam's height, storage capacity and water discharge. It will also monitor the Kongo River basin to assess the effectiveness of a proposed project to link the Kongo and Nile rivers. Egypt's government believes the satellite's findings will bolster its negotiations with Ethiopia and provide legal ground in case it must resort to international arbitration over any violations in the dam's stated purpose of electricity generation, El-Nahry said during a seminar in Cairo, according to Al-Ahram's daily Arabic newspaper. Egypt has been particularly concerned that the dam, now more than 30 percent finished, will hugely impact its share of the Nile, the country's main source of potable water. Last week, Ethiopian Prime Minister Hailemariam Desalegn urged Egypt to return to the tripartite discussions with Ethiopia and Sudan in an effort to settle the dispute. The three countries have been engaged in a series of dialogues since the launch of the project three years ago. Last year, Ethiopia and five other Nile-basin countries – Rwanda, Tanzania, Uganda, Kenya and Burundi – endorsed an accord, the Co-operative Framework Agreement, which replaces a 1929 treaty granting Egypt veto power over any project on the Nile in upstream countries. 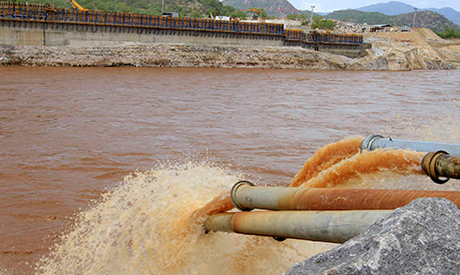 Sudan, Egypt's immediate downstream country, has backed Ethiopia's plans to build the dam. No matter what Egypt will not harm Ethiopia. If Egypt declare or attack Ethiopia, NO NILE FOREVER which will be more risk for Egypt. There are over 20 lakes/rivers makes the blue nile and they are located in Ethiopia. EGYPT MUST COLONIZE Ethiopia to insure nile flow. I don't think this will ever happen too expensive. I suggest Egypt should import from RED SEE OR any other regions, buy or exchange with something. Forget your satellite and invest on water. Lastly Egypt never been part of Africa, wrong place wrong time. No one cares for EGYPT. When millions of Ethiopian died from starvation did Egypt offer anything? I doubt it. INVEST ON WATER INFACT EGYPT MUST ETHIOPIA FOR NILE USAGE FOR LAST DECADE OR START PAYING NUTHING IS FREE IN THE 21ST CENTURY! Egypt must cooprate with Ethiopia in Afforestation programe which increase the water input and long lasting environmental sistainalility.militerisim affect both countries and rise negative effect with other up stream countries.1929 and 1959 colonical trieates are graved by 2010 treaty. i think Egyptians lost their mind. we Ethiopians are totally different in our approach to any one. choose the best method and we will come up with the same. its time for Ethiopia to sell the nile to middle east thru the pipe line.we have absolutely total right in out backyard to do whatever we want. I think that is not the best solution to bring peace , sharing natural resource fairly and equally is the best solution in this planet, we appreciate your advancement on technology but it is only loose money if you are targeted GERD, please come to the table to discuss in all matters and keep Egypt wrights on the Nile." Ethiopia is Nile and Egypt is a gift of Nile ". I a suggestion to Egyptian leaders instead of swaisting their carency for none sense michince of earth and ear get your act together and put up your money spend it for alternative resource, which it is your under ground. Come on and man up guys! Stop being a spoiled child. I dont understand why Egyptians go here and there in search of useless help from others? Ethiopia officially asks egyptians to resume talk. other than bilateral consensus there is no way for Egypt;Ethiopia is on the right track! !GERD project is our hallmark which we are committed to build rather than investing your money on satellite come to talk. I think this is a positive development for the whole Nile basin, as a confidence building mechanism. The contentious issue is that Egypt is concerned about the reduction of water as a result of the Dam, Ethiopia and Sudan believe that the Dam is rather beneficial to all the three countries. In that case, if the information confirms for Egypt that the Dam is not harmful as Ethiopia and Sudan say, then its all the merrier. It helps to build confidence and mutual trust between the country and will help contribute to peace and prosperity in the region. Stop bulshitting and negotiate to buy electricity when the dam is completed. As for the Satellite thing that you are bragging about, we will jam it. What a waste of money! You will also see us smiling at you!